A solution to tendon problems ? Dr David Chapman-Jones, a specialist in sport and exercise medicine, writes this important article about tendons. In association with the Queens Medical Centre, Nottingham, City University, London and a number of European Medical Centres he has focused his research and clinical activities on soft-tissue disorders, particularly those seen in tendons. Dr Chapman-Jones has studied the way they work, heal and why they cause so many problems to both humans and horses. Tendons, like a lot of things in life, are not given a moments thought until they go wrong - and when they do go wrong, as many athletes and horse owners will testify, oh dear, do they go wrong! Imagine the gripe of pain, like tooth ache, every time you move your arm or leg then imagine this becoming progressively worse and lasting, in some cases, for years. This paints a depressingly dark picture but what makes it blacker is the apparent lack of coherent treatment regimes available to sufferers. This appears to be equally as true in the equine world as the human one. So is there an answer as how to reliable and reproducibly treat tendon problems in humans or horses? I believe there is - micro-current, clinically and scientifically proven to be the most effective method to date to treat both chronic and acute disorders in tendons and ligaments. Firstly, a little more about the problem. 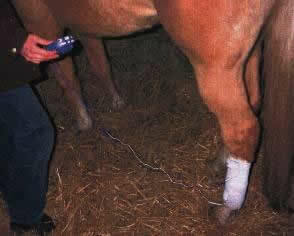 It is a fact that tendons cause problems in humans and tendons cause problems in horses! These conditions can often be career ending in both cases. I was treating a patient with a problematical Achilles tendon and being a horse owner she asked me if the treatment she was receiving would work on her horse that had tendon problems for several months. In view of the fact that the causes of pathology occurring in tendons in horses is almost certainly the same as in humans - multi-factorial, a combination of biomechanical, pathological and structural changes all contributing towards painful, swollen and dysfunctional tendons - the answer had to be yes. However, in order to explain how the treatment may cross-over species, it is necessary to understand why tendons cause so many problems. What is, or are, the cause(s) of the condition in the organ presenting with the problem? And what has gone wrong in the normal repair processes to cause such a long-term problem. - A little bit of biology to explain! Particular cells that are specialised to produce the tissue (collagen) required to make the structure of the tendon are often the reason why a tendon problem fails to get better. In the tendon these cells are located within the tendon sheath and are called tenocytes. The tenocytes appear to become 'lazy' and as a result are less in number and the ones that are present produce less collagen. This is particularly evident as we age or if the tendon is overstressed. This cellular 'go-slow' results in a lack of the protein called collagen, the biological scaffolding that gives the tendon or ligament its structure and strength. This slows down healing in acute (immediate) and chronic (long-term) conditions giving us the problem of how to deal with this problem and treat these conditions successfully. How good are current treatment methods? ¢ the practitioners preference for a particular treatment modality. Laser, ultrasound, electrotherapy, magnetic therapy and others have all been tried and tested - although never very scientifically; their virtues extolled by the promoters the therapies. Yet humans are still suffering and horses are making premature visits to their maker. We have been experimenting with micro-current treatments. Micro-currents occur naturally in the body providing cells with one method of communicating with one another. During injury and illness these currents are disrupted. Research has shown that using externally applied currents of the same intensity, that mimic the body's own bio-electrical system, will promote the healing process. Studies have shown that micro-current electrical stimulation has the effect of promoting and enhancing tenocyte activity that has the effect of accelerating the regeneration healing processes of the tendon tissue repair. Therefore the healing process is hastened. Studies conducted by my research team have confirmed this. The knowledge and understanding achieved with respect to treating tendon and ligament problems in people has proved to be helpful to the equine world. 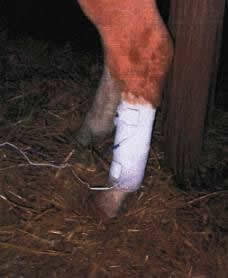 I have now treated several horses with quite bad tendon problems and have had encouraging results with each horse. Healing time is significantly reduced and as a result the return to normal activities is considerable faster. In 1986 an eminent Canadian Sports Physician, Dr W Stanish, researching the effects of micro-current on damaged ligaments, wrote that micro-current therapy was set to revolutionise the treatment of sports injuries. However, studies frequently employed protocols that required daily or twice daily applications resulting in regular trips to the physician for the patient. In addition, the micro-current equipment was specialised and therefore expensive. These factors made micro-current an impractical treatment for more than the fortunate few or subjects participating in an experimental study. Athletes, non-athletes and equine owners now can now treat themselves or their horses with a safe, effective and proven therapy without the inconvenience of repeated trips to the physician, therapist or vet. MicroDoctor is a small, hand-held, battery operated micro-current unit designed for home and professional/clinic use. It has four, easy to use, pre-set automatic programmes which are based strictly upon data from the clinical and scientific studies that have shown that micro-current treatments may significantly accelerate the healing processes in tendons, ligaments and other soft-tissue structures. MicroDoctor is now giving real hope of a successful and reliable treatment for such disabling conditions enabling you to get back to the sport or life you love quicker.